Bala-Backpackers01678 521700work HostelPrices are BRING YOUR OWN LINEN, or hire a Liner for £3, in all Hostel Beds. We still provide the Quilt/Blanket, 2 Pillows and Mattress which must be covered by you. It is clean, safe and nice for the price with a careful, old, arty, homely atmosphere, with hints of Luxury, now called Posh-Packing! There are 4-Star Showers, Bedrooms, Wet-Room, Dining Facilities & Guest Kitchen. Catering is available by arrangement. Bala boasts a five-mile-long Lake, a white-water River, ever popular for Raft Rides, and nestles beneath three 900metre Peaks. The Lake-side, River and Leisure pursuits are 5 mins walk away. Plan your activities or just soak up the atmosphere (not literally! ), by day or evening, in Town. Prices are BRING YOUR OWN LINEN, or hire a Liner for £3, in all Hostel Beds. We still provide the Quilt/Blanket, 2 Pillows and Mattress which must be covered by you. Bala is superb for Sailing, Canoeing, Kayaking, Cycling, Hill-Walking, Fishing, Golf, Wild-Life, Geology, Artists, Music and is rich in Welsh Culture. Leisure centre fun pool ten minute walk away. Five mile lake on doorstep. White Water River up road surrounded by green hills. Children welcome from any age. GR 926 358. Bala is on A494, in mid North Wales. 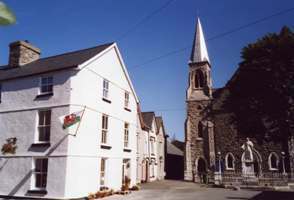 Turn in the middle of Bala High Street, opposite the White Lion Royal Hotel, down Tegid Street to see HOSTEL sign. Loa/Unload outside Hostel, but park round corner, behind Somerfield, in the large, empty and free overnight pay and display, one minute walk away.